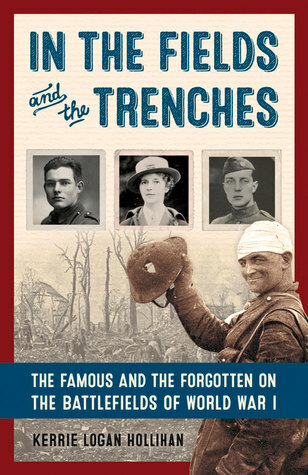 When I first picked up In the Fields and the Trenches, I excepted a traditional World War I history book for kids. I definitely underestimated this title. Hooligan provides exciting glimpses into the lives of successful (and sometimes famous) young people who enlisted in the service or provided support to troops during the Great War. After a brief overview of events that led up to World War I, Hoolihan publishes an extensive timeline in the front of the book. This makes so much sense and will prove useful to teen readers with limited knowledge about the Great War. The book is organized into twelve chapters and introduces readers to 18 amazing young adults who made sacrifices, offered their services, and were involved in combat. Photographs are thoughtfully placed throughout the chapters. Some photos are posed, but there are several candid pictures from battlefields. The book effectively conveys the important roles played by young people in the war. Many of the subjects in the book had successful careers, were accomplished in school, or came from famous families before becoming involved in World War I. Katherine Stinson was a "premier pilot" and stunt aviator before she taught the US Aero Squadron how to use aerial maneuvers to "dodge enemy bullets." Henry Lincoln Johnson worked as a porter at US Central Station in Albany before enlisting with the 15th Regiment of New York. The book also describes how Ernest Hemingway, J.R.R. Tolkien, Harry Truman, Irene Curie, and the children of President Theodore Roosevelt flew planes, delivered messages to troops, drove ambulances, worked in field hospitals and more. The book goes in-depth just enough to provide readers with interesting details about the lives and sacrifices of the subjects, yet the chapters are the perfect length (10-22 pages). The Epilogue ties the stories together with the poem, "In Flanders Field." In Fields and Trenches is a fitting tribute to the many individuals to risked (and sometimes gave) their lives in the Great War. It would be an excellent book to read in high school World History classes. Give the book to teens who are interested in history and biographies. Sounds like a great addition to a classroom library. I taught history for years and always found WWI a difficult topic to get kids interested in. The causes of the war were complex, and the U.S. entered so late. This book looks like it might captivate students' interest by connecting them to the people who participated in the war. Pogo: A New Imprint from Jump!